This lot of stamps, shown to the left, was purchased by "chickfrdstk". 36 days later, the first #338 shows up again on eBay, with the top and bottom perfs trimmed to look like a #356. "THIS STAMP SHOULD NEVER BE BOUGHT/SOLD AS GENUINE WITHOUT CERTIFICATION. WE ARE SELLING THIS AS IS. !........VIEW THE PHOTO AND BE YOUR OWN JUDGE TO MEET YOUR OWN PERSONAL CONDITION REQUIREMENTS AND PERCEPTIONS." 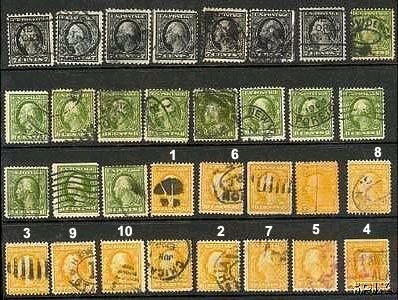 For a little more "fakes, forgery and alterations" fun, click on the picture above and look at the whole lot that "schuylerac" sold. Do the other stamps in the picture seem right to you? 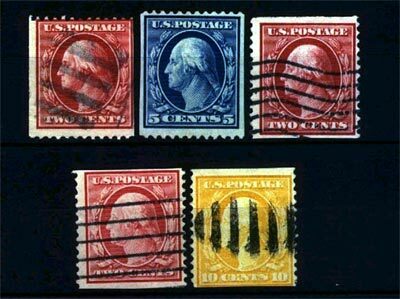 "EACH STAMP IN THIS LOT MEASURES LESS THAN THE GENERALLY ACCEPTED MINIMUM MEASUREMENT. THIS LOT IS SOLD AS IS!!! ......VIEW THE PHOTO AND BE YOUR OWN JUDGE TO MEET YOUR OWN PERSONAL CONDITION REQUIREMENTS AND PERCEPTIONS." 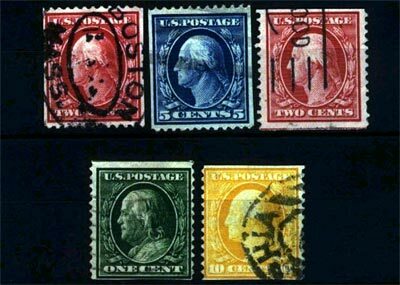 "EACH STAMP IN THIS LOT MEASURES LESS THAN THE GENERALLY ACCEPTED MINIMUM MEASUREMENT. THIS LOT IS SOLD AS IS! ......VIEW THE PHOTO AND BE YOUR OWN JUDGE TO MEET YOUR OWN PERSONAL CONDITION REQUIREMENTS AND PERCEPTIONS." "Beware of stamps offered as No. 356 which may be examples of No. 338 with perfs. trimmed at top and/or bottom. Beware also of plentiful fakes in the marketplace of Nos. 348-355. Authentication of all these coils is advised." The Experts Book, A Practical Guide to the Authentication of United States Stamps, Washington/Franklin Issues 1908-1923, by Paul Schmid 1990 has a few points to make about the 356 issue as well. I will quote him. "This issue is often faked. Over 30% of the almost 600 examples submitted to the Philatelic Foundation and APS expert committees proved to be bogus". Bogus Scott 356's, if they have double line watermarks, can be made only from Scott 338's. The Scott 338 in F-VF condition used has a catalog value of $1.40. You can see why fakers like this issue, when a genuine 356 catalogs at $1250 used. A census of genuine 356 examples show that this issue is usually a tall coil, ranging in height from 25.0mm to 25.2mm. The census also shows that 45% of all genuine examples are centered with bias to the bottom. 30% are well-centered, and the remaining 25% are centered to the top. The 356 is typically yellow or light yellow. Deep yellow or dark yellow orange such as our fakes shown above are often fakes made from perforated sheet stock such as the Scott 338.